Manufacturing notes, not an actual recipe. I used to make applesauce when I lived in New Mexico. 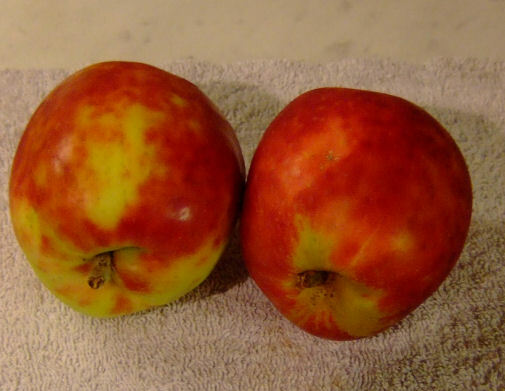 The apples would come ripe in fall and the markets had them at 3 pounds for $1.00. I would buy $7 and have enough apples for a years supply of applesauce. They weren't Gravensteins, but the flavor made up for that fault. I have a peeler corer slicer and it makes quick work of the apples. In a 12 quart stock pot, I would put some lemon juice and sugar in the pot, put the heat on very low and toss the apples into the pot, stirring as each layer built up, to prevent the apples from turning brown. Sugar always had to be added to taste, along with cinnamon, cloves and nutmeg. I would finish the apples and raise the heat to a simmer; cooking long enough to remove the excess moisture and make an applesauce viscosity. Once that was done, the applesauce was transferred to canning jars and heat canned for 30 minutes (1 quart jars). Now I have new information that helps make applesauce taste even better. It's more work and time, but it uses the apple peels to good advantage. As the apples are peeled, rather than discarding the peels, they are simmered in water for 20 minutes. That water is added to the sauce pan, even though it must then be "boiled off". I guess you could put the apples and peels into the stockpot and cook away from there, but the peels would have to be removed at the end of the cooking time. This may not be quite the burden in seems, as the skins toughen under heat and I think they could be removed with tongues easily enough. Hmmm . . . wearing latex glove to scrape the sauce from the peels as they are removed from the pot.